Wood windows are at the top of the price spectrum for home windows for one simple reason – how well they look. While vinyl still has the lion’s share of the replacement market, many homeowners still prefer the beauty and quality of wood frames. There is nothing like the look of wood. It offers an upscale and aesthetically pleasing look to your home that cannot be matched by or fiberglass windows. This is by far one of the most important considerations that affect homeowners when deciding whether to choose wood to replace their old windows. Wood is simply beautiful. There are lots of design options to choose from – leave your wood natural and simply seal it to show the natural beauty or paint & stain the wood in just about any color you want. If you’re willing to pay the price, wood clad windows can be customized to fit any sized opening you want and to provide any look as well. Most wood windows are made from pine, but some of the higher end manufacturers will even use mahogany, which offers a rich and elegant look. You can have wood windows made in any size, design and finish to suit your needs. Wood itself has thermal qualities and they are also less likely to form condensation than their vinyl counterparts. Wood windows are great insulators and work to keep heat in during the cold of winter and keep the house cooler in the summer. This can help keep energy bills lower, which over the life of the window can add up to some nice savings. These price ranges include both the window itself and the installation, which can account for a third of the overall cost. More on wood window prices. They can swell or shrink when the temperature changes. Excessive moisture can cause them to warp or rot. Exposure to the sun or overly dry climates may cause them to split or crack. Insects, such as termites, can destroy the wood. Without proper upkeep, you may find your wood windows warping, sticking, splitting or cracking – they may not look as good as you’d like, and they may not function so well either. Window maintenance is definitely required to keep them looking and functioning at their best. This means you’ll need to periodically seal the wood, or re-paint or re-stain it and then seal it, to keep it looking its best. You’ll also need to check for insect and water damage and repair any potential problems. As with any windows, you’ll also need to make sure that the panes are not cracked, and check the glazing, putty and caulk. If you’re willing to do the maintenance required, however, wood replacements will last for years and years, and will continue to add beauty to both the interior and exterior of your home. Wood windows used during new construction allows you to choose stock size windows and make the opening fit the window. When installing them in this way, you need to replace the interior and exterior trim around the windows. There are, however, some companies that allow you to order windows in custom sizes so they can be made to fit right in the existing opening. 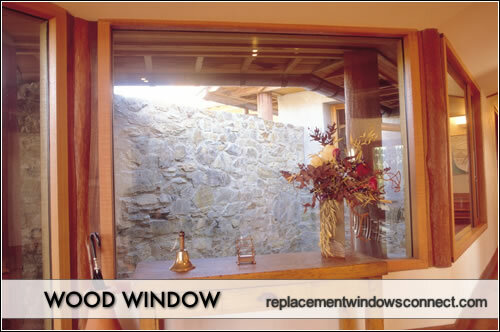 But, if you are not going for this option (which is a bit pricey), then you can’t simply replace a new window in the opening that exists from your old one without some additional construction. Wood windows generally cost more than vinyl or fiberglass. This is especially true if you need to order custom sizes from the window manufacturer to fit the existing opening of your window. Some companies, such as TrimLine Windows, allow you to order custom sized windows to fit right into the space where your old windows were but don’t charge custom prices. While these may be cheaper than ordering custom windows, they are still not inexpensive and are considered higher end windows. Another factor you need to consider is that you may need to replace the existing interior and exterior trim, add insulation, and do other construction work, which will add to the overall cost.